Ryder called it the largest-ever purchase of commercial electric vehicles in the United States. All 1,000 vehicles will be operated by FedEx Express for commercial and residential pickup and delivery services in California. They will have a maximum gross vehicle weight of 16,500 pounds and a cargo capacity of 6,000 pounds. Ryder will provide all the preventive maintenance, warranty work and parts distribution services for the vehicles, which are to be delivered beginning in April, and then over the following 12 to 18 months. “The whole idea of the partnership between Chanje and Ryder is to create that springboard effect so we can provide the Chanje product all across the North American market,” Chris Nordh, Ryder’s senior director of Advanced Vehicle Technology, told Transport Topics. Ryder announced a similar leasing and service relationship in 2016 with Phoenix-based Class 8 truck maker Nikola Motor Co. Production of Nikola’s hydrogen-electric heavy-duty trucks is scheduled to start in 2020. The barriers to entry [for new original equipment manufacturers] are smaller than they have been traditionally, he said, noting Ryder has a total of 800 service locations and 6,000 technicians. “Taking a look at what Tesla has been able to accomplish, I think a lot of companies are wanting to do the same thing in the commercial space. And I think there is room for such disruption to take place, right now,” Nordh said. Tesla manufactures battery-electric passenger cars and has announced plans for a battery-electric Class 8 truck scheduled for fleet testing in 2019. But Chanje has the only electric vehicle on the market right now that is scalable for a commercial application such as FedEx’s, Nordh said. “FedEx continually seeks new ways to maximize operational efficiency, minimize impacts and find innovative solutions through the company’s reduce, replace, revolutionize approach to sustainability,” FedEx Chief Sustainability Officer Mitch Jackson said in a statement. 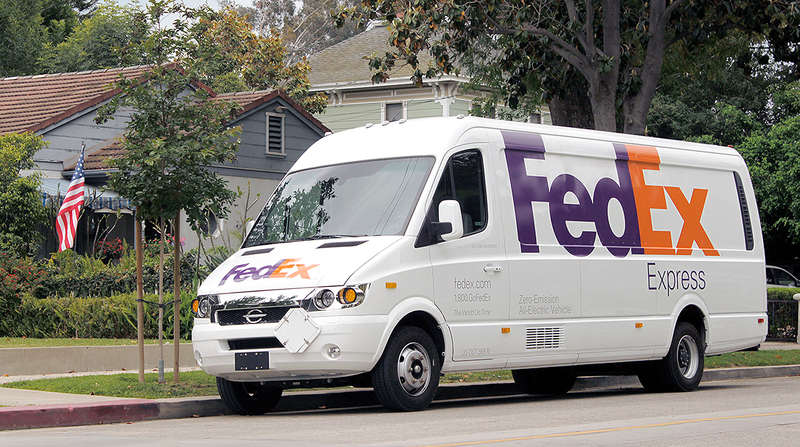 The FedEx vehicles will be able to travel 150 miles when fully charged and have the potential to help FedEx save 2,000 gallons of fuel while avoiding 20 tons of emissions per vehicle each year, according to Memphis-based FedEx. The Chanje vehicles are manufactured in Hangzhou, China, by Chanje’s parent company, FDG Electric Vehicles Ltd. At the same time, Chanje is in the process of building a plant in the Los Angeles area to assemble the vehicles, Nordh said. Nordh said Ryder was watching the new 10% U.S. tariffs imposed on certain goods and commodities from China, which are set to climb to 25% beginning Jan. 1, barring a new agreement before then. “It is something that we are definitely cognizant of and monitoring on a daily basis to see if the costs are going to change drastically based on any changes in the tariff structure. But based on what we are currently looking at we have accounted for that,” he said. None of the traditional OEMs have yet produced electric vehicles like Chanje’s. So there is an early-mover advantage that these new companies have against the traditional OEMs, he said. “How quickly are [the traditional OEMS] going to catch up is the question. And if and when they do, does that mean these new players don’t have a space anymore? It’s something we don’t know yet,” Nordh said. Meanwhile, all U.S. truck makers have reported they are starting to test various prototypes of electric vehicles.